The election was held on 24 March, 1990. Labor’s Bob Hawke faced his fourth election as leader, while the Liberal Party had returned to the leadership of Andrew Peacock in 1989. An economic recession in the late 1980s had affected the government’s standing, but voters had not significantly embraced the opposition. The election was fought largely on economic issues, especially in Victoria which was facing a dire financial crisis. Peacock campaigned on a new, mature image. The government narrowly retained office, winning 78 seats to the opposition’s 69, along with Independent MP Ted Mack. The election was the peak of the popularity of the Australian Democrats, who won 11.26% of the primary vote and came very close to winning one or more seats in the Lower House; leader Janine Haines’ high-profile attempt to win the Adelaide seat of Kingston was unsuccessful. National Party leader Charles Blunt lost his seat of Richmond to Labor due to the preference flow from anti-nuclear campaigner Helen Caldicott. Robert James Lee Hawke was born 9 December, 1929. Hawke was the Prime Minister of Australia 11 March, 1983 - 20 December, 1991. He was the leader of the Australian Labor Party. 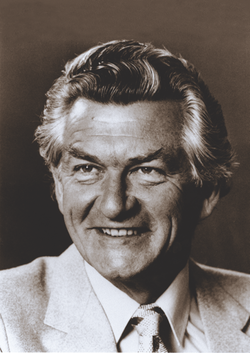 Hawke represented the electorate of Wills, Vic 1980 to 1992. The message I bring to you today is a message of confidence in the future of Australia, and a renewed commitment to a better, fairer future for all Australians. and above all, on the strength of the Australian people. I know that we have had to take hard and unpopular decisions for difficult times. I know – I understand completely – that those decisions have been tough for many decent, hard working Australians. But I also know that I would not be fit to lead our great country if I had chosen the easy, popular way at the cost of the nation's future. And anyone – however glib or smooth – who tells the people of Australia that the future lies at the end of an easy road is not fit to be your Prime Minister. This is not a time for slogans or hollow rhetoric. It is a time for leadership. It is a time for substance. It is a time for realistic policies. It is a time for real answers. It is a time for vision with realism. And now more than ever, it is a time for stability and unity in government. And by those tests, the people of Australia have never had a clearer choice. And in a very deep sense, the choice lies between two opposing principles – the choice between opportunity and privilege. This, in the final analysis, is the great divide between Labor and the Liberal/National Coalition – a profound difference over goals for the nation, and over a range of specific issues: taxation, education, training, industrial relations, health care, child care, superannuation. On all these vital issues, you have the decisive difference – Labor working to enlarge equality of opportunity for all; a Liberal/National coalition working to deny opportunity and entrench privilege. a plan to protect Australia' s precious environment for all time, for all Australians. a self confident and vigorous partner in the world economy and in the economy of our region – the region of the future. The new proposals I present today are achievable, responsible, fully paid for. By contrast, our opponents, at last count, had a credibility gap of $6000 million in unfunded promises. Our new proposals build on our years of hard work together – our work together to create one million six hundred thousand new jobs, to take 250,000 people off the dole. The task of managing the Australian economy in these times of strong growth has, of course, called for rigorous policies – and sometimes tough decisions. And let me say frankly to all my fellow Australians: there was no decision tougher for us than to have interest rates that hurt home buyers and squeezed business. None of us has enjoyed that. But our task was to get the right economic climate, so that the falls, when they came, could be sustained. Because we've followed the right policies, interest rates are going down. And that's the verdict of the banks which set them. Now is the time for further measures to reform our economy and to improve your living standards. The first element in our plan is the wage/tax and superannuation package we are presenting for your endorsement on 24 March. It is a package which will deliver to the average wage and salary earner the equivalent of an extra $50 a week in wage rises and tax cuts, in four stages over the next 16 months. It is a package which meets fully the tests of economic responsibility, fairness and foresight. It is a package which the country can afford. It is a package which the working men and women of Australia deserve. It is not something which the Government is handing out. It is something which you have earned by your work and restraint. Our package to raise wages and cut taxes –responsibly, fairly, steadily – is central to Labor's plan for Australia's economic strength. By stark contrast, our opponents, with breathtaking irresponsibility, seek to govern without a wages policy. They have no better idea of the outcome of that lack of policy, now, than the Leader of the Opposition had last November when he said: 'Who's to know?'. But in fact, we do know. We know who would suffer. We know it from their record. The Liberal and National Parties would give us the law of the industrial jungle, where the rich, the powerful, the groups with most industrial muscle, would grab the big but short lived gains. A system that is fair for all would be replaced by a free for all. Theirs is a recipe for a wages explosion – for runaway inflation – for massive unemployment. It is a recipe to feed higher and higher interest rates. It is a recipe to destroy the award restructuring which is doing so much to reform Australian industry. But there is another, immensely serious, consequence of the Liberal/National desire to smash our wage/tax package and the Accord with the trade union movement which underpins it. Australians now have for the first time a national superannuation scheme which all people covered by industrial awards can enjoy; a benefit which helps fight inflation; a benefit which prepares Australia for the ageing of its population; and a benefit which the nation and its businesses, large and small, can afford. Yet the Liberal/National coalition would sabotage this national savings plan, a plan already amassing a huge bank for investment in Australia's export and import replacing industries. Because of our policies, eight out of ten Australian employees already get an average of $15 a week paid into their own personal superannuation scheme by their employer. Over the next three years, under our package, that will double to $30 a week saved for your retirement. And let me add for those who have retired or are planning their retirement that no aged or service pensioner will pay any income tax by 1995. Every one of the dollars saved through our superannuation plan helps finance Australia's development without foreign debt. It's a national savings scheme – good for you, good for Australia. It's too important to be put at risk. We need more exports. We need more competitive industry. We need manufacturing muscle, built on the backbone of our great mining and agricultural resources. We have begun, strongly begun, that process. Under Labor the proportion of people working is at record levels. They are better educated than ever before, better trained and working with better tools and technology. What better base for productivity growth? And what more complete rebuttal could there be of the Opposition's putting down of Australia's productivity as virtually zero than the official figures released here and overseas just this very week? There's the fact – Australia's productivity is on the rise, and sharply so. Seven years ago, Australia's steel industry was on the verge of shutdown. We have together - government, unions, employers – transformed the steel industry. Today we are exporting steel to the world – $750 million in the last year. The value of these exports will treble to over $2 billion by 1992. Seven years ago, our motor vehicle industry was collapsing under the weight of self-defeating protection and inefficient work practices. Today we are shipping Australian cars and car parts to Japan and the United States. Our ship building industry has been revitalised. Now the Europeans can catch a ferry across the English Channel – made in Tasmania. We are now exporting electronic equipment to Asia, pharmaceuticals to Europe and optical lenses throughout the world. Australia is now one of the world's great tourist destinations, our telecommunications industry is leading the way into export markets, and our exports of education, health and legal services are achieving unprecedented growth. But we can do more. We must do more. Earlier in this campaign I outlined Labor's integrated strategy to boost Australian exports. And I outlined a ten point plan to lift further the productivity of our industry. No longer content to be just the lucky country, Australia must become the clever country. To realise that vision I am announcing bold new initiatives today to build on our substantial achievements in education and scientific research – to unleash the skills and talents of our people. When we came to office, thirty six per cent – around one in three children – completed high school education. Today, sixty per cent finish Year 12; that's sixty seven thousand more kids a year with a better chance in life, a new opportunity for the future. To assist parents with the financial burden of keeping their children at school longer, for their children's good and the country's good, we will introduce a new Education Completion Allowance. $600 and an increase of $115 – paid at the time when the demands on parents for books and equipment are greatest. And we want to encourage that ever-increasing number of young Australians ?nishing high school to strive for excellence. So today I'm announcing the Australian Students Prize. Five hundred awards of $2,000 each will be made to our best young achievers at the end of Year 12. And for all these kids finishing school there is now a greater opportunity than ever before for a job - or, if they choose, a place in universities, TAFE colleges, apprenticeships and job training. My Government has already dramatically boosted our science and technology potential – with a $1,000 million package of initiatives last year. But to stay abreast and move ahead of the world, we need to pool the talents of our university, Commonwealth, State and private sector researchers and link them more effectively to the rest of the economy. The Government has now decided to establish a network of fifty world class Cooperative Research Centres. These research centres will create additional jobs for about 1,000 talented Australian scientists. They will be established over the next five years, built around outstanding research leaders and pooling the talent of outstanding research groups not only from the CSIRO, other government research organisations and the universities, but also from private industry. skilled scientists, using the latest high tech equipment, exchanging information around the world – making scientific breakthroughs in medicine, technology, pollution control, communications. And so, instead of young Australian scientists having to go to Europe, America and Japan to find the leading edge of scientific research, we'll have their scientists coming to us. The new centres will be located wherever possible on or near university campuses, so that research staff can help in the equally vital task of training young researchers. This is the most significant step ever taken by a Federal Government to draw together the strengths of Australian researchers. It will equip Australians with the scientific research capacity to take our modern nation into the 21st century. At the same time we cannot afford to exclude any group of Australians from making their contribution to the national mobilisation of resources. In particular, a Labor Government will never accept that any fit and able Australian is unemployable. We will never accept the proposition that some Australians are expendable, to be dropped through a trap door and forgotten. We offer instead a safety net of training and re-training for the unemployed. We will abolish the dole and replace it with a Jobsearch allowance for those actively seeking work. For those who cannot find a job after 12 months, there will be a Newstart allowance, conditional on accepting training or retraining for available work. Despite our success in lifting the proportion of children staying on to finish school, we recognise that some schools and some kids are still missing out. Therefore, Labor will provide $37 million over three years to address literacy and learning problems in disadvantaged schools. Further, we will expand Secondary Education Hostels for Aboriginal Children. And we will provide $60 million over the next two years to improve school facilities, equipment and curricula. There is a new generation of social issues facing those who live in the outer areas of our cities. The voluntary groups and State agencies that have to deal with crisis in peoples' lives, day today, know that isolation is becoming a major social problem – isolation from employment opportunities, from family support, from education. I now commit my Government to provide, with the States and voluntary groups, a new level of Commonwealth support. We will extend marriage counselling services. We will establish Family Resources Centres. We will support State efforts to care for teenagers after school. And we will help provide improved transport for outer urban areas through the provision of more trains and buses. The total cost of these measures will be $128 million over three years. In the task of national mobilisation to build a more productive and competitive economy, the women of Australia have a key role. Today – International Women's Day – I re-affirm our deep commitment to equality of opportunity for the women of Australia. It is a commitment to give women a full say, a real choice and a fair go. We recognise that if women are to have a real choice, they need access to child care. That is why we have established what is already one of the best systems of child care in the world, and why we will make it even better – more places and more affordable access to them. Under our existing child care strategy we will have created 144,000 new child care places by 1992. Of itself that represents a trebling of child care places since we came to office. Today I announce that we will be making available additional funding capable of creating, with the States, another 50,000 child care places over the next five years. And, further, we will provide the incentive for employers to extend child care in both the public and private sectors. We expect an estimated 28,000 new places in employer provided and commercial centres. To do this we will greatly increase the fee-relief for low and middle income families. It will mean, for example, that a family with a gross income of $30,000 a year, with one child at a child care centre, will receive a fee-relief benefit of $65 a week – over twice the benefit currently paid. And for the first time, we will extend fee-relief to low and middle income families using commercial child care centres. Parents are entitled to be con?dent they are getting quality attention for their kids, whether they are using Government-funded or commercial centres. So we will work with all the key interests in child care to develop a system of accreditation. In all, we will spend some $400 million in what will constitute the biggest expansion of child care in Australia's history. We estimate there will be a quarter of a million places by mid-1996. Last week in Perth, with Premier Carmen Lawrence, I committed my Government to new policies for women – including a national program for the early detection of breast cancer, fully funded at $64 million over three years. Central to everything I am putting forward today – and central to the decision you will make on 24 March – is the kind of Australia we want for our children. And that's not just a matter of education and jobs and opportunities and economic growth. It is, very importantly, the natural environment they'll inherit. We in this generation have no greater responsibility than to pass on intact to future generations Australia's priceless environment. My Government unequivocally accepts that responsibility. That's why we stopped the damming of the Franklin. And that's why we protected our irreplaceable rainforests, the tall forests of Tasmania, the Great Barrier Reef and Kakadu. Nor do we accept that this responsibility ends at Australia's shores. We are leading the fight to prevent mining in Antarctica. We are leading the fight to end the barbaric practice of drift net fishing in the South Pacific. We are making a strong scientific effort to help tackle the greenhouse and ozone problems and are banning virtually all use of CFCs. And our commitment to the environment will not end there. I will be making a separate statement on the environment in the coming weeks. It has been said that those who do not learn the lessons of the past will be condemned to repeat them. Everything the Coalition has done, and all it still stands for, shows that they have not learned the lessons of their past failures, and that they wish to condemn the nation to a traumatic and socially destructive repetition of them. I said at the outset that the great divide between us lay between opportunity and privilege. There are two key issues in this election which starkly show the difference – capital gains tax and Medicare. billions of dollars that would have been available for education, health, training, roads would be shovelled into the pockets of less than one in a hundred Australian taxpayers. The capital gains tax is a fair tax. The vast majority of wage and salary earners do not pay capital gains tax and never will. And you find on Medicare that same conflict between privilege and opportunity. For all their confusion, their twisting and turning, the truth is that the Liberals and Nationals would dismantle Medicare – scrap bulk billing – leave two million and more of our fellow Australians without health cover – benefit only the wealthy – and saddle the Australian family once again with all the burden, the anxiety, the cost, the inconvenience and the confusion that existed before we delivered affordable health care to every Australian. I will tell you our policy in two words: Medicare stays. A party that cannot govern itself cannot govern Australia. And that's why I've said that your choice on 24 March will determine whether our highest aspirations for the future are to be fulfilled. We can attain stronger national prosperity from a world competitive economy – greater financial security for families – a ladder of opportunity for all Australians – unshakeable protection of the natural environment. We can attain these goals – in the 1990s. Under Labor, Australians will attain them. That is Labor's pledge for Australia's future. And it is my pledge as Australia's leader. I don't seek to create false hopes or to raise unrealistic expectations. There is still hard work ahead of us as a nation. None of us should be under any illusion about that. But I make my pledge for the 1990s with confidence because we have already done much of the hard work, laid the enduring foundations, taken many of the tough decisions in the 1980s. Remember: the reason for those tough decisions and the discipline in the 1980s was precisely so that we can, with continued and united effort, create a more secure future, in a stronger Australia. Only Labor can make that continued and united effort – and only Labor can create that more secure future. Because only Labor has the plans, the vision, the guts and the leadership to assure our country's future – a future rich in hope and promise as we approach the threshold of the 21st century.